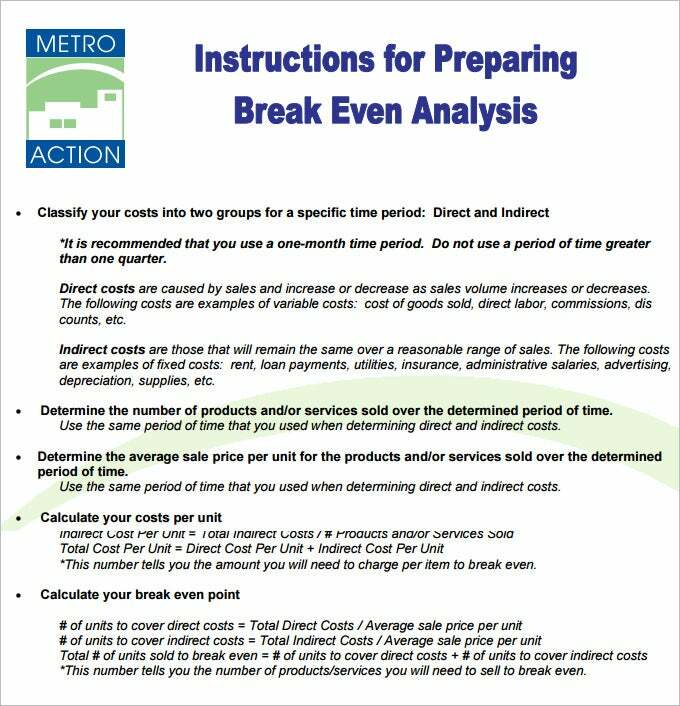 The breakeven point in a Break Even analysis is the amount of sales you are required to generate to take care of all the fixed and variable costs and break even. At this point, the business has neither made any profits neither has it made any losses you Broke Even. 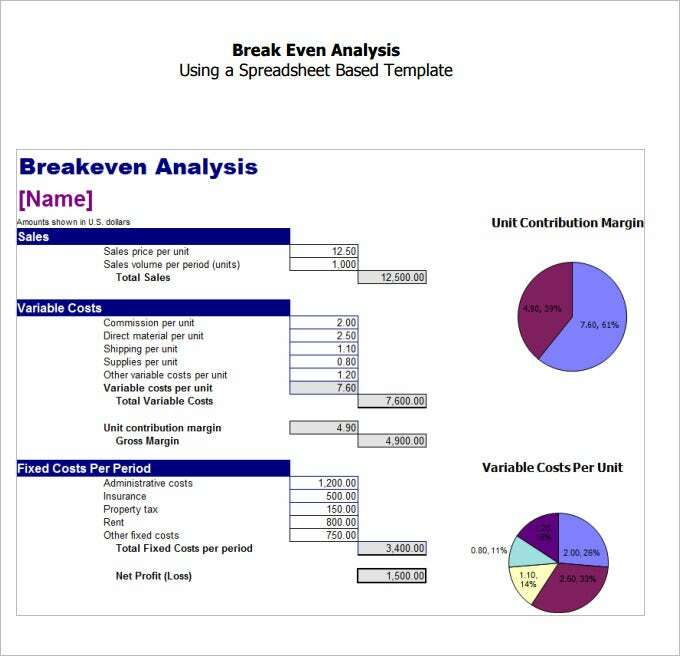 Breakeven point during a Break Even analysis is calculated with three elements: fixed costs, sales and variable costs. Variable costs are those costs that favor your sales, which mean if sales go up they go up as well for example labor and materials. You can also see Risk Analysis Templates here. Knowing your variable costs and your sales, then you can calculate your margin. Fixed costs are those that stay fixed no matter the sales level for example rent. 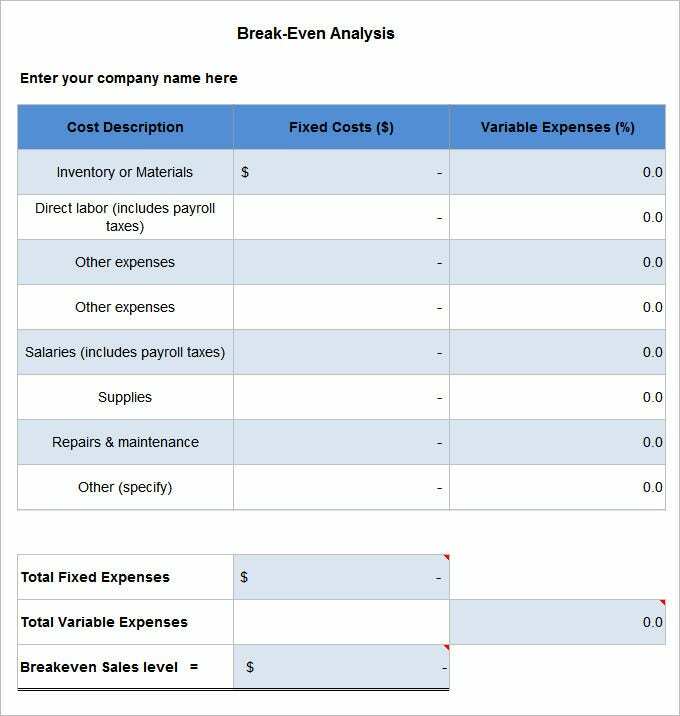 Your records need to be very accurate in order for you to use them in the calculations.Break Even analysis template will then be used to determine your pricing, variable costs and the overhead. The calculation of the breakeven point on the key business components will help uncover the non-performing SKUs, the areas where you are overspending as well as unprofitable customers. You may also see Work Breakdown Structure Template. The Break Even Analysis is the analysis of the all the variable and fixed cost in comparison total sales revenues. The new ventures need to analyze such break-even point so it helps to uncover the non performing SKUs, the areas where the overspending and unprofitable assets. At the time of launching the new product or redefined the existing product the company needs to analyze the each and every cost related to the product fixed as well as variable to reach the break even point. This break even analysis helps to ascertain the sales generated for the product. The Break Even analysis of the project involves the calculation of all the cost, whether fixed and variable for the concerned project. This analysis helps to ascertain the budget and break even point for the project. It evaluates the non required cost or overspending. The results recorded in the break even analysis template will then help you set better targets aimed at generating more profits for the company and how to best do this. For a business owner to come up with an accurate breakeven point, they must have accurate margin information for all their products. The data and information should be calculated and to ascertain the break even point in the break even analysis with the amount of sales and fixed and variable costs. The break even point is the point the business has neither any profit nor loss. Break even analysis is evaluated with help of the three elements such fixed, variable or sales. Variable cost are the cost of the product whch are variable in nature.